Home / Author: Mary Massey, Ed.D. I am a life-long learner, eager to glean knowledge, ideas and information from others and grateful for the opportunity to share. I have served as a public school music teacher, daycare director, primary school principal, college professor, and minister of music. My favorite service, however, has been to my family as a wife and mother to two incredible children, who are now adults. I am thankful for the varied experiences I have gone through to get where I am today. I am a child of God, saved by grace and loved by our heavenly Father so much that He sacrificed His Son for me. I live a grateful life. I grew up in northern Indiana. For as long as I can remember, I drank a cup of hot tea every morning. My Dad was a hot tea drinker and I guess that trickled down to his children, at least to me. He didn’t care anything about fancy teas. There were never any black teas or green teas in his life. He drank Lipton’s. He reused each tea bag until the hot water barely changed color when he poured a new cup, before he switched to a fresh tea bag. This is my Dad’s birthday week and he has been on my mind more lately than usual, although I don’t think there’s a day that goes by that I don’t think of him. He is celebrating in heaven these days. He’s been there since June 28, 2011 and I can only imagine the joyous celebrations he enjoys every day . . . well, I guess there aren’t days in heaven, so he’s just rejoicing all the time, nonstop! What a beautiful thought! I sort of see my Dad like his tea bags. . . giving, giving, giving . . . until there was nothing left to give. I always knew him as what is now referred to as a “blue-collar worker”. He worked for Indiana/Michigan Electric Company (I & M) until he fell off a truck and broke his back. He endured two back surgeries and was, eventually, put on permanent disability. Later, he would have some heart issues that added to his health concerns. He and Mother had five little “stair-step” children. Dad insisted my Mom stay home with us children, so he worked wherever and however he could to provide for his family. Back when there were full-service gas stations, he manned the gas pumps, cleaned windshields, and checked oil at a local station. He also rode on the back of a trash truck for a few years. I know that had to be excruciating for him. For a time, he made lamps in our basement that he sold at local flea markets. I would sit down there for hours and watch him use masking tape to connect coffee cans, forming the shape of a tree branch. He would then tape small Dixie cups to the cans. Next, he covered his creation with Plaster of Paris and before it dried, he used a fork to fashion what looked like tree bark. We would take a break at that point and go upstairs for some hot tea. Once the plaster was dry, Dad chose just the right stain or paint (I’m really not sure what that brown stuff was) and those cans, cups, and plaster turned into a tree branch. Somehow, with his electrician background, he made lamps out of these everyday items. I believe Mother picked the lamp shades, I don’t have a clear recollection of that process, but I remember being so excited with each finished product! He even made some birch tree lamps with whitish bark and shading. He really was quite crafty. I never really realized that at the time. I just saw him as my Dad who could do a lot of different things. I think I thought all dads could do a lot of things. We moved to Alabama in 1970 at the suggestion from Dad’s doctor that his quality of life would improve in a warmer climate. Indiana winters were brutal and, although all five children helped with chores, our Indiana pig farm (especially in the winter) was more than Dad could handle. We had visited my Aunt Mary, Dad’s sister for whom I was named, just about every summer I could remember and south Alabama was Dad’s choice for relocation. Even there, he worked at a gas station for a while, he did handy man work around town, and ended up doing remodels and reroofing houses. By this time, Dad was in his fifties and sixties, had a bad heart, bad back, and was ridden with arthritis, yet he was climbing atop hot tar roofs. Still giving. In 1996 my Mother was killed by a 16-year-old drunk driver. My Dad was severely injured in that car crash. Yet, in the years to follow, my Dad started and ran a program at his church, feeding needy families. Dad got up every morning and drove to The Good Samaritan House where he kept a detailed log of those who came in for groceries, oftentimes turning folks away who were greedy and came back sooner than the schedule allowed. I know that was difficult for him, but he was a rule follower and only thinking of those who would come in next and needed help, as well. He was in his seventies and eighties at this time. Still giving. In 2009 Dad moved closer to my sister who lived in southcentral Alabama. He had his own place, so he could be independent, but my sister worked right around the corner from him, so she could eat lunch with him every day and visit with him very frequently. Always active in his local church, this move didn’t change that. He became involved with the benevolent program at his new church and continued his life of service. Still giving . . . but his tea bag was getting weaker and weaker. His body began to betray him and, as hard as he tried to continue his active lifestyle, he became limited in what he could do, eventually being confined to a wheelchair. In just two short years, his tea bag would lose its punch and Dad became confined to his bed. The last conversation I had with him was on the phone as I drove away after visiting him for the last time. Even though we had said our goodbyes, I just felt the need to call and hear his voice one more time. He made reference to the end being near and, through my tears, I said, “You know, Dad, this is what you’ve looked forward to your entire life. You’ve worked hard to be the man you are and you are about to inherit your crown of righteousness. Thank you for showing us the way.” We exchanged “I love yous” and that was it. He died two days later. The tea bag was all used up. I drink hot tea every morning, still, and every morning, I think of my Dad when I pour the hot water into my cup. I thank God for giving me such an amazing father and, although I’m anxious for our heavenly reunion, I pray my tea bag has a lot more to give until that fine day. One of the many great lessons I’ve learned from my Dad is, just like a tea bag, sometimes our best flavor doesn’t come out until it is steeped in hot water. May I emerge from the hot water as flavorful as my Dad. I’ve always had a fondness for porches. Growing up in northern Indiana, I remember playing with my siblings out on the porch, usually only if it was raining because if the weather was nice, we were running up and down the sidewalks, playing in the yard, or riding our bikes. But the porch was always there as a retreat, so we wouldn’t have to go inside if the weather turned ugly. The grownups in our family spent a lot of time on the porch, as well, so when they were out there, we always found somewhere else to be. My Dad’s mother, my “Bigmama”, shelled peas on the porch. I remember her scooping them up in her apron to take them inside. My “Bigpapa” would sit beside her, a silent partner in the shelling, but I imagine he always looked forward to enjoying those peas. My Mother’s mother and step-father, my “Grandma and Grandpa”, sat on the porch and watched the traffic go by. My Grandpa would sometimes water the front lawn with the garden hose, sitting on the knee wall. I often wondered what he was thinking about, as he appeared to be a million miles away, watching the water soak deep into the ground. I remember both sets of grandparents sitting on the porch to watch the rain, even thunder storms. I didn’t really understand their fascination at the time, but I do now. Both my paternal and maternal grandparents had metal gliders on their porches. We loved those gliders and would pile up in them. I’m sure we pushed the gliding capabilities to their limit. Siblings, cousins, and friends would rush to see how many would fit and, somehow, we always found room for everyone. My maternal grandparents were smokers and my Dad would often refer to the “little lights on the porch” we could see as we drove passed their house on the way home from church services. It was too late to stop on school nights, but he always honked the horn and we all waved. Since I’ve been married and living in Florida, we’ve never really had a porch. The houses we’ve lived in have had more of a stoop outside the front door, barely room for a potted plant and certainly not big enough for a chair. I imagine that’s because of the sweltering heat and the need for air conditioning. Time spent in the sun is usually reserved for the beach or those who don’t have a choice, due to employment, at least when summer is at its peak. I guess that’s why I’m so excited about the house we live in now, in Tallahassee. We’re farther north in the state and we actually have a bit of a change in seasons . . . certainly much more so than Central Florida. We even have a fireplace! I’ve missed many things about Indiana, my friends and family, basketball (It seems the Midwest is more into basketball and the South more into football – I like both, but miss those fast-paced games! ), looking out at the fresh-fallen snow, riding snowmobiles (many thanks to the Ryan family for those memories), and so much more . . . but, I especially miss my time spent on the porch. I guess maybe that’s why it’s been important to me to revisit my porch time, the older I get. Precious memories are made, friendships are born, bonds are strengthened, and oftentimes, much needed soul searching, revelations, and “ah-ha moments” surprise us, while visiting on the porch. Our current house came with a double rocker on the front porch. It is well worn with a good bit of the paint already chipped off, but I don’t think that wear is from use. I think, rather, it’s from the bright afternoon sun that beats down on it every day. That sun has done a number on our wooden front door, as well. 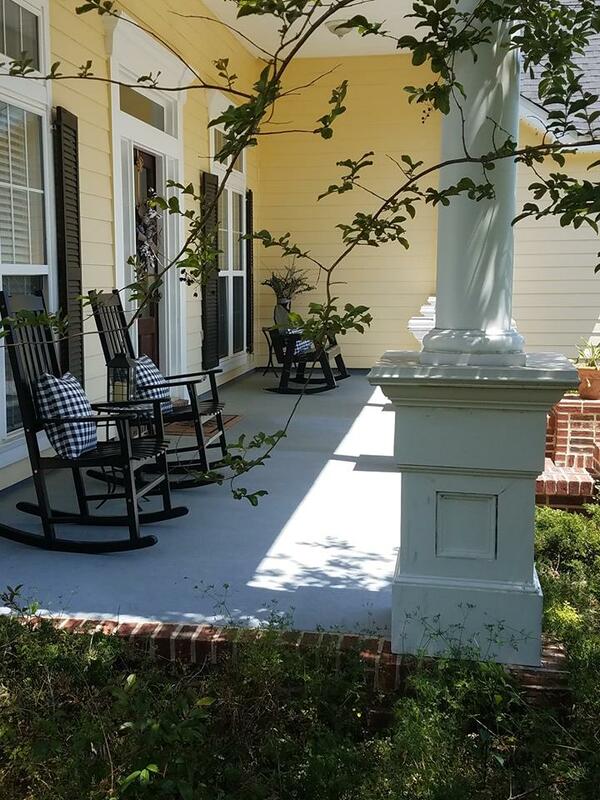 The first year we lived here, my family gave me two wooden rocking chairs for Christmas and those set on the opposite side of the porch as the double rocker. Lots of room for everyone! I’m grateful for dear neighbors who feel comfortable enough to take time out of their busy schedules to join us on the porch, every now and then. We have enjoyed hot coffee, tasty wine (stronger libations for some), and yummy snacks on the porch. But, what I’ve enjoyed the most is our conversation and shared bursts of uncontrollable laughter. I love seeing how much alike we are and I love developing a deeper understanding of and appreciation for what makes us different. The day after one couple sat with us on the porch for hours, laughing and talking, another neighbor said, “It sounded like you were having a good time last night. Next time, how about coming over and knocking on our door so we can join you!” Just what I wanted to hear! It wasn’t long before that couple joined us on the porch, treating us to some of their favorite wine and some amazing smoked gouda/crackers! We learned a lot about each other and we laughed a lot that night, too. It’s as though sweet music filled the air with each burst of unbridled laughter! I can’t help but think, if we took the time to join one another on the porch from time to time, perhaps our thoughts would be kinder, our words would be sweeter, our hearts would be gentler, and our lives would be richer . . . no doubt, this world would be a better place in which to live. Come on over, my friends. You’re always welcome on the porch! This week I watched a video clip of Mister Fred Rogers speaking before the Senate about funding for his PBS television show, Mister Rogers’ Neighborhood. It was the same Mister Rogers my children (and I) watched every day. It was that same calm voice, quirky smile, kind spirit and sensibility. That man was a genius and if we could only have cloned him, I believe this world would be a different place today. In the clip, Mister Rogers talks about starting with his first television program in 1954 at the cost of $30. In 1969 he said the cost was about $6,000. He went on to say that amount was what it cost to produce about two minutes of cartoons or what he sometimes referred to as “animated bombardment”. He shared that children need to understand their feelings are “mentionable and manageable” and that it was “much more dramatic for two men to be working out their feelings of anger than by showing something of gunfire”. You could see his genuine and sincere love for the future of our children when he said, “I’m very much concerned about what’s being delivered to our children in this country”. He went on to explain a bit about what the show was taught, “We deal with such things as the inner drama of childhood. We don’t have to bop somebody over the head to make drama on the screen. We deal with such things as getting a haircut, or the feelings about brothers and sisters or the kind of anger that arises in simple family situations and we speak to it constructively. I give an expression of care every day to each child, to help him realize that he is unique. I end the program by saying, ‘You’ve made this day a special day, by just your being you. There’s no person in the whole world like you, and I like you, just the way you are.’” That is Fred Rogers . . . affirming, encouraging, motivating, inspiring, loving and kind. Mister Rogers could have come out swinging at the very thought of PBS funding being cut, but he didn’t. He behaved in a respectful, kind, and loving manner because that’s who he was. That’s what he taught and that’s what he lived. He had no desire to put anyone down for suggesting such a cut or ridicule them at the very thought. No, he seized a teachable moment and he taught kindness, by modeling it. He taught kindness through his words, his expressions, his demeanor, his responses, his respect, and his presence. Oh, to only be one small portion of that man in how we present ourselves to the world. Well, I’m going to try. I’m going to try to seize the teachable moments in my life when maybe, just maybe, I can make even a very small positive difference in someone’s life. I’m going to try. Like you, my friend, I like you. Oh, and Senator Pastore’s response to Mister Rogers? “I think it’s wonderful. I think it’s wonderful. Looks like you just earned the 20 million dollars.” Here’s to Teachable Moments and one of our greatest teachers! Almost two weeks ago, I reported my car stolen. Two days later I reported it had not been stolen and the explanation for what happened “was a long and complicated series of events.” I wasn’t trying to hide anything from anyone, in fact, several people have endured my sharing of the “long and complicated series of events”, but as the days have gone by, I have felt it more and more important for me to follow the post about the stolen car with a post about the car that was not stolen. If you are satisfied that I still have my car and I am thanking God that it wasn’t stolen after all, you can stop reading now. If you feel as though you want/need to know “the rest of the story” (another nod to Paul Harvey), read on at your own choosing . . .
That Friday my daughter, Alex, and myself had made a plan for a fun day together. She had some flex time from work, my husband, George, was out of town, and she had taken her dog, Sadie Mae, to doggie day care to play with her friends because she had been showing us she needed some socialization. We had been looking forward to this fun day together and were excited to get started! Alex picked me up at my house (when we’re together in Tallahassee she almost always drives because she has lived here for 10 years and she knows all the back streets, etc.) and drove to a new brunch place that recently opened in our neighborhood. We LOVE brunch and were excited to check out this new spot. We were enjoying our meals (see picture) and Alex’s phone rang. It was her hairdresser. Now this needs an explanation (see, I told you it was long and complicated). Most of you know Alex has been working to grow her hair out after having had two brain surgeries. She found a great stylist who is young and hip and has worked closely with Alex on this journey. Alex hadn’t been to Haleigh for several months because she was in a place where she just wanted to see some length. Recently, however, she thought maybe she would get it colored to at least give it some pizazz. She had called and asked if they would put her on a cancellation list so she could get in quickly. You guessed it, this was that call. Alex told them she would be in as soon as we finished brunch (Hello! What’s important here?) and that’s when the plans for the day began to change. I told Alex I would rather her drop me at my house and go on to the salon so I could get some things done instead of sit at the salon for two hours. She had already purchased movie tickets online, so we knew we had a tight time frame with the hair coloring and logistics of traveling from one place to another. I asked her to just keep me informed as to how the hair coloring was going. Fast forward an hour or two . . . Alex texted and said she was running a bit later than she thought and didn’t think she could come back to get me and make it to the movie in time. I told her I would just meet her at the salon. I drove my car to the salon, we left it there and she drove just down the street to the theater. Her hair looked really pretty, as Haleigh had styled it, as well as colored it, but it was a wee bit brassy. We would later see it as orange, but I’m getting ahead of myself. We were excited to see “The Mountain Between Us” (excellent movie) and it did NOT disappoint! At brunch and on the way to the theater we had been discussing an event that was approaching for which we both had a lot of responsibilities. We decided we had time to run by the florist and order the centerpieces and then could check that off our list of things to do. It took much longer at the florist than we anticipated and as we left we realized we had to drive across town to get Sadie before 6 p.m. Yikes! We headed in that direction and were happy to see Sadie, tuckered out from her play date. We headed to my house, as we had already talked about getting in our PJs and watching movies. It was a fun day and a fun night. Alex decided to stay over since we were up so late. Saturday morning we woke up late and just chilled for most of the morning. We worked a little on the event, putting together lists, checking on RSVPs, etc. We played outside with Sadie, did a little baking and before we knew it, it was dark. We decided to watch some more movies and you guessed it, Alex ended up staying over again. We got up the next morning and got moving. Alex and Sadie went home and I began to get dressed. While putting on my make-up I made note that George would be coming home that day. I wasn’t sure what time he would get back in town, so I thought I should move my car so he could get into the garage. I usually park to one side of the driveway, but because he was out of town, I had parked in the middle of the drive, knowing I would be in and out. I finished getting ready and walked out to the garage, opened the garage door and my heart sank when I faced an EMPTY driveway. I thought to myself, “Maybe Alex moved my car for some reason.” “Maybe I parked in the front and didn’t remember it.” So many thoughts rushed through my mind until I thought . . . “Someone stole my car!” I’ll pause here for a minute to say there had been some car break-ins in our neighborhood recently . . . not so much stolen cars as people checking car door handles and if they’re unlocked, they steal what’s inside . . . so I had that on my mind. I called Alex and said, “Someone stole my car!” She said she was on her way. While I waited I thought I should go ahead and call the police because sometimes when you call the non-emergency number, it takes hours for someone to come out, so I thought I’d get a jump on it. I called and reported my car had been stolen out of my driveway. The dispatcher said she would send someone out. I then called my son, Will, to see if his dad had left yet. He said George was already on the road, so I didn’t want to give him the news while he was driving. Will suggested I call the insurance company, so I hung up and did that. Alex had arrived by then and when we heard the door bell, she answered it because I was on the phone with the insurance company. The policeman was very tall and we later learned was a former marine sharp-shooter. He was probably close to my age and was very kind. He asked several questions and even apologized for asking some of them. He said some people take offense when you ask things like, “Where are your car keys now?” “Did a family member borrow your car without you knowing, possibly?” “Could you have parked it somewhere and forgotten about it?” Do people actually do that, I wondered? I assured him I was not offended by any questions, I just wanted my car back. He asked if we could walk out to the driveway. We did. There was no glass on the driveway, which didn’t make any sense, although we had read about some thieves who can access the key fob in your house and somehow get into your car, so that made it seem possible. The policeman wrapped things up, gave me his card with the case number and his badge number on it and drove away. Alex and I went back in the house, sat down and just looked at one another. We couldn’t believe what was happening! We went over the night before and neither of us heard anything outside. Sadie didn’t bark. We called our neighbors whose house is at the end of our driveway. They said they heard a car door around midnight, but nothing else. George arrived home and we did the same, sat and looked at each other in disbelief. The insurance guy had told me to begin making a list of everything that was in my car, so I did that. George mentioned a few things for me to add to the list. I just kept dwelling on the fact that my car is 10 years old and has 160,000 miles on it. Who would want it?? One of my neighbors even asked me that! I lamented that George had just changed the oil and put 4 new tires on the car and I had just filled it up with gas. The policeman did tell us that Mercury Grand Marquis are often stolen and converted into taxis but he said that happens in New York and in Miami, mostly. That was the weekend of the Miami-FSU game, so we became convinced someone from Miami stole my car. I cancelled my SunPass transponder, thinking maybe they would get caught going through the tolls in my car. Boy, the things we thought about that day. Tuesday Alex went to work and then back to see Haleigh to get her hair color changed. She drove into the parking lot of the salon and there was my car. What?? She called me and said, “Mom! Your car was NOT stolen! !” I said, “WHAT???? ?” She said, “It’s here at Tryst (the salon)! !” At that moment, the events of the past four days flooded my mind and I remembered parking my car in that parking lot on FRIDAY and never thinking about it again, until it wasn’t in my driveway on Sunday. My car was not stolen. Thank You, Jesus! I have amazing friends and family. I can’t begin to list everyone who encouraged me, supported me, and prayed for me during this crazy time. What really prompted this blog post is that I received a package from my dear friends, Donna and Judy, from Orlando. They sent CDs to start my “new collection.” I thought, I have to sit down and tell them what happened! They won’t believe it! But how sweet to send me those CDs!!! Don’t be so quick to call the police. Had Alex and I sat down and gone over the events of the weekend, I’d like to think we would have remembered I had parked my car at Tryst. Don’t post on social media. If you have to write it down, write it down to get it out, but don’t be so quick to share it. I wouldn’t be writing this long, long post if I hadn’t shared about the car in the first place. Don’t be so bound up in plans. I’m a planner and I think when the plan changed, I was still so entrenched in the original plan, I didn’t adjust things in my mind and that was the beginning of my thinking my car was stolen, because I never planned to drive to Tryst in the first place. Things are just things. Pretty self-explanatory. Don’t beat yourself up. I really felt terrible for wasting the time of the policeman who came out to the house initially and the two officers who had to come out and verify the car was found. I really felt terrible for wasting the time of the insurance guy. They all told me I wouldn’t believe how much this happens to them. Somehow that didn’t help, but I appreciated their efforts to make me feel better. I felt badly that I hadn’t had my act together enough to figure out where my car was before I reported it stolen. I felt badly that some people might think this was the beginning of some mental deficiency in me and what that might mean for the future. But I finally settled into, it is what it is and I’m just grateful I have my car. Never say never. It can happen to you. It can happen to me. It DID happen to me. I will say, this experience has been very, very real to me. . . more real than I imagined. Recently, when I saw a new CD advertised on TV I thought, “Wow, I don’t have any of my CDs anymore” and then I realized, no, my car was NOT stolen. I have my CDs. Another time when I was walking out of the back door that leads into the garage I thought, “I need to remember to lock this door because they have my garage door opener” and then I realized, no, my car was NOT stolen. They don’t have my garage door opener. It’s been two weeks and there are things that still come to mind and for an instant, I revert to that feeling of loss, until I remember my car was NOT stolen and I am so grateful. My car was stolen over the weekend. I was home. My car was parked in my driveway and it was locked, yet someone was able to sneak onto our property in the dead of night, get into my car, start it, and drive away without anyone seeing, hearing, or knowing anything about it. I’m still a bit numb from that realization. My car is 10 years old, has nearly 170K miles on it and has no bells and whistles. It did have 4 new tires, a full tank of gas, and the oil had just been changed, but I doubt the thieves knew that before they made the decision to take something that wasn’t theirs. I’m told the Mercury Grand Marquis is sometimes stolen and converted into a taxi, although I doubt the thieves have plans to embrace their entrepreneurial spirit and begin a taxi business. I had just begun carrying in my trunk 20 of my children’s books, 10 of each, so when I came upon someone who asked me about them (which actually happens sometimes) I could just pull one out. I even went to Office Depot and bought a plastic bin to keep them in so they would remain flat and in great condition as the container slid around in my huge trunk. I doubt the thieves will appreciate my efforts to inform children and their parents about Gardner’s Theory of Multiple Intelligences. There are somewhere between 80 and 100 CDs in my car. I love turning the music up on my trips to see my family or traveling for book signings, so I carried all of my CDs in my car. I have an eclectic taste in music. My CDs include opera, Broadway, pop, country, rock, Motown, children’s music, Christmas (yes, I listen to it year-round), gospel, hymns, jazz, blues, contemporary Christian, praise and worship, and I’m sure something I’ve left out. I doubt the thieves will enjoy any of my CDs. A huge puppy cover is spread over my back seat so when I transport Sadie Mae, she is comfortable and doesn’t slide around on the leather seat. Somehow, I can’t imagine the thieves loving and caring for sweet puppies. Years ago I heard someone speak about the importance of carrying a special device in your car to be prepared if you are ever trapped in your vehicle. I bought several of the devices that will cut the seatbelt and break the car window. I got one for every vehicle in our family. There is one in the glove box of my car. Somehow I think it will be used for something other than saving a life. I haven’t shed one tear about my car, although it’s been a really good car. The trunk is massive and has been packed to the brim on many road trips. It’s carried 5 or 6 adults on many occasions so we could all be together and visit, rather than traveling in 2 smaller cars. It’s the car we bought when my first Grand Marquis was totaled in a multi-vehicle crash on I-4 in Orlando. A van driver decided he wanted to be in my lane instead of his and rammed my front, right quarter panel, sending me across the 3-lane interstate. We were hit a total of 5 times, 5 different vehicles, one was an 18-wheeler. Alex was with me and screamed each time a vehicle crashed into us. By the grace of God, and after an ambulance ride to the ER for some minor injuries, we stood up and sang with the praise team the next morning. So, we bought our 2nd Grand Marquis. It’s a mighty tough car, but, it’s a car. It has been and will continue to be a hassle for me to deal with the police, the insurance company, the car dealer, and the inconvenience of all of it, but it’s a car. No tears for a car. I haven’t even felt anger. Maybe in my younger years I would have been upset and allowed the anger to well up within me. I don’t know, but I haven’t felt anger. What I have felt is sadness . . . deep, almost debilitating sadness at times. I’m just so sad that there are people in this world with such disregard for their fellow human kind . . . people who are so egocentric that they make very bad decisions that impact the lives of others . . . people who are so lost, they feel they have no choice but to hurt others . . . it makes me very sad. Sad for them. For quite some time I have been frustrated by what appears to be an ever-increasing disregard for paying attention to detail. I see it in my students’ assignments, store clerks, correspondence from companies, employers’ reviews, etc. At first I thought maybe it was just my OCD that made it so glaring for me, but the more it happens, the more I believe it is a trend . . . a very dangerous one. That may seem like a melodramatic statement, but consider the risk when prescription bottles are mislabeled. It’s very telling when attorney practices set aside resources for pharmacy mislabeling mistakes alone. A simple typo can wreak havoc on a company’s finances. Don’t take my word for it; check out The High Cost of Small Mistakes: The Most Expensive Typos of All Time by Cameron Fennell. Today I received some correspondence from a company regarding my retirement from the university system. Once again, the funds had been transferred to yet another company and they were notifying me of the transfer (i.e. You now have a zero balance with us because we put your money somewhere else). Look closely at this picture. Check out the date. Seriously??? It says the money was transferred (past tense) on August 8, 2107. Hmmmm . . . . This is an official document! I’m just at a loss, truly. My take on this (for whatever it is worth and that’s probably not even 2 cents but it helps to get it off my chest) is that we, as a society . . . parents in particular . . . have stopped expecting excellence from our children. We went through a time when we were more concerned about their feelings than we were about their development of life skills that would sustain them (and their communities). I believe we went overboard not wanting our children to cry, to hurt, to know failure (everyone gets a trophy). It may have begun as a noble cause and honestly I believe feelings are important. We want our children to be empathetic, loving, and caring, but the fallout from expecting less is damaging. It’s damaging to our children, personally, and to our society, collectively. We stopped setting expectations to which they could rise. We stopped demanding they repeat a task because they hadn’t completed it correctly the first time. Instead we gave them an “A for effort.” Instead of figuring out the cause for bad grades, we took them for ice cream to make them feel better. Scholarly research even shows great benefits toward academic success when parents expect excellence. This may seem harsh, especially from someone who has dedicated her career to the health, education, and welfare of young children, but I believe because I have seen it from all sides over the course of many years, I have a unique perspective. 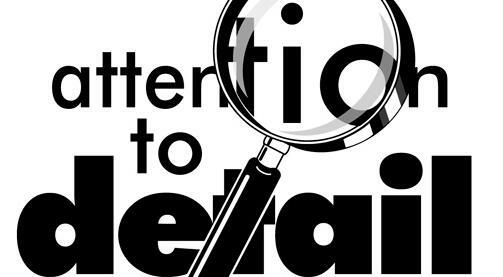 I am convinced society’s trend toward not paying attention to detail is directly connected to our lack of expectations for our children. Allow me to share a personal story with you. When my daughter was about 10 years old, she was washing dishes. She was in a hurry and wasn’t rinsing the dishes thoroughly, putting them in the dish drainer with soap suds on them. I pointed that out to her and told her she needed to rinse all of the dishes again. She had a meltdown and began to cry, telling me it wasn’t a big deal and I was being too hard on her (Clearly, she just wanted to be done with it so she could go outside and play). I calmly explained to her that it was my job, as her mother, to teach her the correct way to do things. If I didn’t, I wasn’t doing my job and that was unacceptable to me. I explained that the soapy dishes would have a film on them and asked, “How would you like it if your milk tasted soapy?” I told her I wanted her to grow up with the skills she needed to take care of herself and proper dish washing was one of those skills. I guess it made sense to her, because she stopped crying, re-rinsed all the dishes and went about her day, unscathed. I had to stop what I was doing and seize what I like to call a “teachable moment”, but it was well worth it. Could it be we are just too busy and involved in so many other things, we don’t always take the time to clarify expectations for our children in order to help them grow and develop? I will say, the best result of these few moments together is that my daughter is now an adult, owns a home, supports herself, and is a vibrant and productive member of society. She is also very empathetic, loving, and caring. Score 2 for the daughter, 0 for the trend. The good news is, this trend is fixable! It isn’t a terminal disease that offers no hope. We can change the trend. We can begin expecting children (of all ages) to spell correctly, use proper grammar, check and double check assignments/tasks, repeat a task until the outcome is a success and work to do their best in everything they do. Children will rise to our level of expectations. I believe that and it is vital to the health and well being of our society because those children grow into adults who check your groceries at the store, cash you out at the bank, prepare your legal documents, deliver your babies, fill your prescriptions, teach your children, sign your paychecks, report the news, are elected to office, make the laws . . . I pulled the last sheet of paper towel off the roll this morning and stopped my breakfast-making to go to the pantry and get another roll. That one simple, mindless act conjured up a memory that stays with me to this day. . . I was visiting a family member several years ago and I sat and watched as she made coffee for us. After spilling a little water on the counter, she reached for the paper towel holder and saw the roll was empty. UGH. The expression on her face was one of frustration, but also a bit of sadness. I said, “I’ll get one out of the pantry” and started in that direction. She replied, “There aren’t any more.” At that moment she walked over to the table where I was sitting and fell into the chair beside me with a look of total defeat. Now, I knew this person well enough to know this wasn’t about running out of paper towels. And so the unveiling of her realization began . . .
She opened with, “I would just LOVE to have a spare ANYTHING so when I run out, I can just go get another. I don’t need a full pantry, just enough to tide me over to the next trip to the grocery. Most people have that, don’t they? You have that, don’t you?” She wasn’t complaining or feeling sorry for herself. She was simply sharing her state of being and trying to make sense of it. She went on to say she only had enough money each time she went to the grocery to buy what she needed. There was never enough money to buy two of anything, so she could have a spare. Still, she wasn’t complaining. She was opening up . . . more and more each moment we sat there. She was questioning her life, her choices, her mistakes. She was wondering how in the world did she end up where she was. She overflowed with gratitude as she counted the many blessings in her life, but she always came back to that empty pantry. She sat in complete confusion as to how she landed in that place. I think about that day every time I refill my paper towel dispenser, toilet paper holder, salt shaker, cereal container, cookie jar . . . I think about it every time. Every time. I think about the choices that lead us and guide us and the mistakes that change us and detour us. I think about the many, many people who never saw the angst on her face or heard the longing in her voice when she opened up to me that day. The many people who figured her pantry was full, like theirs . . . the pantry in her house and the pantry in her heart. Both empty. Who knew? My Dad was one who could see into other people’s pantries. After my Mom was killed by a drunk driver, my Dad began a ministry to stock the pantries of those who shared that same angst on their faces and that same longing in their voices. It was called The Good Samaritan House. He was particular about who was able to come in and get groceries . . . he picked out the scammers right away. He could see the empty pantries on the faces of those who needed food. He could hear the empty pantries as they longed to be filled. He saw both the empty house pantries and the empty heart pantries. He knew. Discernment. He had it. I only saw my Dad really angry twice in my life. Once when we were at a high school football game and the guy behind us shouted, “Break his leg when you tackle him! Get him out of the game!” My Dad came off the bleachers like a stone from a slingshot and verbally put that guy in his place. “You don’t EVER wish harm on another person in a ball game! It’s a game. It’s a sport. You don’t ever wish someone harm!” The other time was when one of those scammers came into The Good Samaritan House and he had found out this person was single, no family and made it a practice to go around to every other ministry in town, telling fabricated hard luck stories and then would turn around and SELL the food!! That guy couldn’t get out of the door fast enough when Dad refused him food and exposed his greed. Dad couldn’t stand by and see someone hurting and he wouldn’t tolerate someone taking advantage of his efforts to help those in need. There were many times he gave, when he really didn’t have it to give and that’s when it became clear to me that my Mother saw the empty pantries, too, or she wouldn’t have been able to accept and encourage my Dad’s generosity and selfless actions. That family member with the empty pantry? My Mom and Dad saw her empty pantry and worked to keep it well stocked. 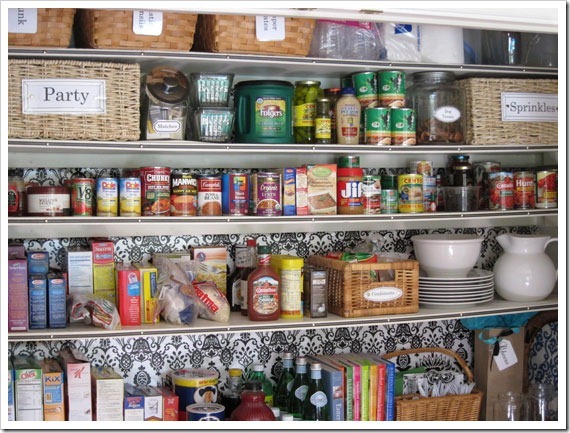 Now she’s living in her heavenly mansion, which I’m sure has a pantry that looks a lot like the one in the picture. My Dad is living in his heavenly mansion, as well, and no doubt he is one of the chief pantry stockers, in word and deed. My Mom, too, is living in her heavenly mansion and I imagine she’s Dad’s most valued assistant in pantry stocking. And I am grateful every day for my full pantry and for the memories that fill me up with gratitude for having known and loved them all. I was born and raised in South Bend, Indiana. My parents were southerners, my Dad from Alabama and my Mom from Georgia, but they settled in Northwestern Indiana after having two children. They added three more children to the family while in Indiana. I followed my older brother and sister through elementary school, entering the 6th grade with Miss Toy as my teacher. The first day of school that year she said to me, “I taught both your brother and your sister. I’m expecting great things from you!” She was big, tough, and scary and I was intimidated. During that school year, after attending school with the same friends in the neighborhood since Kindergarten, we moved out to Osceola, IN, a small, rural town on the outskirts of South Bend . . . all new people . . . all new places. My brother had just graduated and my older sister was now in high school. My sister just younger than me was at a different school and my youngest sister was not in school yet. I truly felt alone. I remember recess was spent playing four-square. I thought it was fun and I was okay at it, so that’s what I did every day . . . until . . . one day I stepped up and some punk said, “Who’s that new girl? She’s so homely!” I don’t think I knew what “homely” meant at the time, but I knew it wasn’t good and I never played four-square again. Time went on and I made good friends throughout middle and beginning high school. I became involved in learning German (our German teacher also attended our church) and in “Daffy Dolls”, a cheer group for the wrestling team (only in IN), named after Coach Daffney (not sure of that spelling). I had a steady boyfriend from our church group, although he went to a different high school, things were good. I finally felt “at home” and then . . . in the middle of my sophomore year, my Dad told us we were moving to Alabama. Seriously???? I thought my world had ended!!!! I didn’t realize it at the time, but my Dad’s health was deteriorating and his doctor told him he needed to live in a warmer climate. My Dad never made the move about him. He tried to help us realize it was the best thing for our family and, after all, we visited south Alabama every year to see relatives and we loved it. He knew we would be okay. The decision was made for me to live with my German teacher and his wife and finish out my sophomore year. For that I will always be grateful. Herr Simmons and Frau Simmons were fun, energetic and wonderful role models. As an adult I look back at their generosity and willingness to bring a teenager into their home for several months and I marvel at such a giving and gracious spirit. The summer after my sophomore year my older sister flew to South Bend to accompany me on my flight (my first flight ever) to Alabama . . . leaving my friends, my boyfriend, my church family . . . heading to what seemed to be a strange, unknown, faraway place. That is the first part of the story . . . leaving those with whom I would have graduated high school. Even they weren’t life-long friends since I moved there in the 6th grade, but they had become my school family and because of chorus, football, Daffy Dolls, German classes and daily interactions, I just couldn’t wrap my head around the fact that we would not be finishing high school and graduating together. I think it’s just my nature, but I couldn’t “rebel” any longer. I love people and I love “doing” and eventually I made many friends and began to get involved in school activities in my new town. My senior year I was one of the VPs of the Senior Class, was honored to be on the Homecoming Court, participated in the Junior Miss Pageant and was named “Most School Spirited” in senior superlatives. I became known as the Notre Dame-loving “Yankee” transplant and lovingly mocked for saying “you guys” instead of “y’all.” Wow. What a difference a year made. The reality was, however, many, if not most of the folks in my “new” graduating class went through school life together, at the very least they went through four years of high school together and I, once again, felt like an outsider. Graduation . . . off to college . . . Class of ’72 reunions . . . What to do? 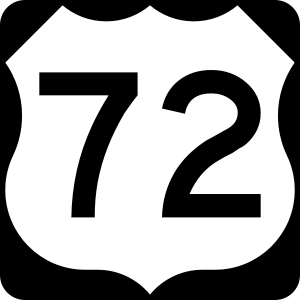 I no longer felt I was a part of the Penn High School Class of ’72 because I didn’t go through graduation with them, but I also didn’t feel as though I was an integral part of the Foley High School Class of ’72 because I only spent two years with them. For decades I lost touch with both Indiana and Alabama friends. I wasn’t a PHS grad, so I didn’t receive reunion info from them. FHS classmates always included me in reunion info, but I never felt “worthy” of joining friends who would reminisce about elementary, middle, and high school fun. So, I stayed away . . .
Another fast forward: FHS classmates persevered and continued to reach out to me (along with many others who hadn’t participated in reunions) until, much like my senior year, I began to feel a pull to get involved. They have always embraced me as one of their own, it just took my acknowledging that to feel their warm embrace. I now am part of the reunion planning committee and have a ball whenever I’m able to get together with this group of fun friends. We have far more in common that we do differences and the length of time we’ve been together is certainly secondary to the love we share for one another. Thanks to social media, I’m reconnected with PHS classmates and, although I didn’t graduate with them, they were gracious enough to allow me to join their FB page so I can stay informed about how they’re all doing and what great things are happening in their lives. Many of them have requested my friendship on FB and we have fun bantering back and forth. I haven’t made it to one of their reunions and I’m still not sure that’s my place, but I’m thrilled to be able to stay in touch with so many of those with whom I spent some very formative years. PHS classmates just gathered for their 45th high school reunion this past weekend. I have loved going through the posted pictures, watching the videos, and seeing somewhat familiar faces, conjuring up wonderful memories of long ago. FHS classmates are in the midst of planning an incredible reunion in October and I’m thrilled to be a part of the excitement and anticipation. So now, instead of NOT feeling a part of ANY graduating class, I am grateful for the blessing of TWO graduating classes. It all comes down to friendships, some longer than others, some stronger than others, but all built on a foundation of love, developed over years of growth, respected through maturity, and held dear through the eyes of aging . . . 1972, it was a very good year. I am grateful, Class of ’72. Well, it’s that time again! I have finished my second children’s book and sent it off to my fabulous illustrator, April Bensch. My SMART Parts series continues by focusing on each of the intelligences or “SMART Parts”, individually, through a character introduced in the first book. Book 2 spotlights Will and Word SMART. It shows how Will uses this dominant intelligence to work on developing some of his SMART Parts that aren’t as far along. It’s important to remember we all are born with every SMART Part and we have the ability to develop them to their full potential. Isn’t that great news!?!? This is the original painting of Will’s page. I love the way his friends are reacting to one of his riddles! You can see Emme and Jimmy are baffled, but it looks as though Maggie may have the answer! Will is modeled after my son, Will. He is definitely Word SMART and has a great time sharing jokes, puns, riddles, and funny stories. Will is also an accomplished presenter. He is an HR Specialist with Billy Casper Golf, Inc. and is called upon regularly to present information to staff and train new staff members. I’ve seen video of some of Will’s presentations and they are quite entertaining! His command of the English language gives him a wonderful advantage in communicating with others, whether it be official presentations or familiar conversation. This illustration shows Will working on his Body SMART Part, or body/kinesthetic intelligence. Will loves to play basketball and he golfs, both of which are wonderful ways to strengthen his Body SMART Part! He also water skis and roller blades when he can. Another way Will works on his other intelligences is through music. He has become Music SMART through his own focus on learning to strengthen his musical skills. Will plays drums, guitar, saxophone, and electric bass. He also has an awesome bass voice. The illustration of Will is taken from his “bowl cut” days, as a child. It is very accurate as a depiction of him. He chattered away as a baby and toddler, talking and singing throughout his day, every day. Yes, Will is truly Word SMART. Here he is enjoying his 2nd birthday. Watch for the next book, Will, the Word SMART Wizard! It should be out shortly! I’m excited to share this second book in the SMART Parts series with you and introduce you to TWO NEW CHARACTERS! In the mean time, check out the first book, Ellie Rae Discovers Eight Ways to be SMART at www.createspace.com/6609237. I can’t believe how long it’s been since I posted here. Wow! My book was published in November 2016 and I hit the ground running, it seems! I’m so excited and extremely grateful that Ellie Rae Discovers Eight Ways to be SMART has been received so enthusiastically, not only by my friends and family, but by the multiple intelligences/education communities, as well. I have shared my passion for MI teaching/learning with my students, teachers, parents and future teachers for many years; but, I’m thrilled to have the opportunity to share Gardner’s theory with little children, on their level, in the form of this book. Understanding they are SMART, just SMART in their own special way, helps to lay a foundation of self-awareness and self-confidence at the beginning of their formal education. Knowing they have the ability to nurture and grow their intelligence is a profound motivation and terrific encouragement as they grow and develop. MI also goes hand-in-hand with Growth Mindset, which is being incorporated into the curriculum in numerous schools. It was so much fun to be working with my dear friend, Kelly Baloun, again. Kelly is now the Director at Tiny Tots of Apopka. We have known one another for over 17 years and we have worked together to spread the word about MI for many of those years. Her daughter, Ellie Rae, is the title character in my book. I spent an entire day at Ellie Rae’s school, speaking to the entire student body. It was invigorating! The students were very well behaved and they asked questions that really showed higher order thinking skills. Over the weekend Kelly and I presented at the Association of Christian Schools International conference. Those who attended our sessions were very receptive to my book and Gardner’s theory. We discussed practical application for their classrooms and daily lives. MI works! And more and more people are realizing the value of perceiving children through an MI lens or perspective. I had a great time in December, visiting my great-niece’s school and meeting Camden folks for a Book Signing at Camden Jewelry and Gifts. What a fun time! I will be traveling to south Alabama for several book signings and back to the Orlando area to participate in a couple of Literacy events in February and March. If you would like for me to stop in at your child’s school or, if you’re a teacher and would like to arrange for a visit, I’d love to schedule something with you! Happy reading, friends!